The procedures and court rules applicable to division of a 401K in a divorce is not as straightforward as for example the division of your real property or bank accounts. Even ou have a divorce decree issued by a court states that the retirement benefit shall be divided between you and your spouse, it is not enough to receive a portion of your or your spouse’s retirement. The division of the retirement benefit becomes possible only if there is qualified domestic relations order (QDRO). A qualified domestic relations order is a court order granting a spouse a right to a part of the retirement benefits his or her ex-spouse has earned through participation in retirement plan. 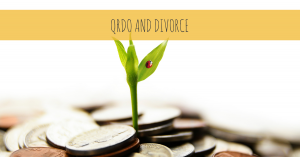 QDRO could be obtain a long time after the divorce decree is issued. However, it is better to prepare and to file a QDRO with the plan as early as possible. The reason is if the party who worked for employer retires after finalizing a divorce, and there is no QDRO has been filed with the plan, the participant begin to receive retirement. If a QDRO is issued after making payment to the retiree, the plan will not apply the payment retroactively. When a judge sign off on QDRO it confirms spouses have right to certain portion of the funds. Qualified domestic relations order is also helpful for the spouse who owns the 401K because it would let him to avoid penalty for an early withdrawal on a distribution money from the account. How 401K divided on divorce? It depends in which state you live. there are community property states and equitable distribution state. In equitable distribution state the fairness factor is the center for deciding the division of property. The court will look how capable other party in producing income, financial condition of each party, how long the parties were marriage. In community property state , including California, the spouses divided community property 50-50. It means the spouses needs to split 401K account 50-50 during the time the party was working for employee while he/she was marriage. How can spouses distribute 401K divorce portion? One of the way is the spouse of account holder can rolling over this portion to his/her own 401K . Another way is account holder will cash out his/her spouse with different assets. Lastly, the spouse of account holder should wait until the account holder reaches retirement age and starts the distribution . Why spouse needs to proceed with QDRO without delay? It is important to know that if there is no retirements benefit division in your divorce decree, the ex-spouse does not have rights to the retirement benefits of participant. If a spouse did not addressed 401K in the divorce, the attorney needs to re-open case. That why it is essential to address it in the first place. We will prepare your QDRO, file with the court and do joinder if needed for flat fee $599. There is a free on-line calculator for determining the value of 401K over the time.